Earn merit awards on Earth! Roll dice. Higher roll goes first. Each player takes a die with 9 facing up. Sort merit award cards into 5 piles, certificate side down. Shuffle playing cards and deal, face-down, 4 to the first player and 5 to the second. Place 5 playing cards face-up in a row and place remaining cards face-down in a pile. Face-down moolti-pass cards count as one draw, BUT a face-up moolti-pass counts as BOTH draws. Moolti-passes are wild and can be used as any card(s). Immediately replace drawn face-up card with a card from the face-down pile. Complete an award, if possible, using cards in hand. Discard played cards into a face-up pile. If completed, take and flip the merit award card and place on your side. If you can't complete a merit award, turn your dice down one number (9 to 8 to 7 . . .). 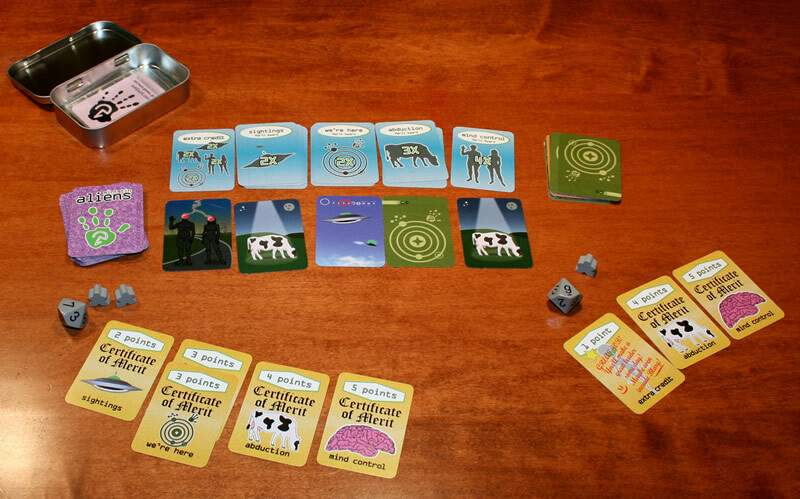 First to complete one each of sightings, we're here, abduction, and mind control gets two meeples. Second to complete gets one meeple. If the set of four is not completed, you don't get a meeple. If needed, reshuffle discarded face-up playing cards to continue until all merit awards and extra credit are completed. If ALL face-up cards relate to awards that have all been claimed, discard ALL face-up cards and replace from face-down cards. Total your award points. Add to that the total number of award cards you have*, plus 1 point per meeple, plus the number showing on your die. Interrupted early? End after the second player's turn and add up your points. * Let's clarify "add the number of cards you have." Say we have a game that uses dollar bills for game points. You have twenty $1 dollar bills and I have one $20 bill. We both have 20 points. But if each bill is also worth a point—you have 40 points and I have 21 points. This can reward you, in Mint Tin Aliens, for collecting smaller value merit awards and not simply holding out for higher ones. Mint Tin Aliens' scoring is similar to points for longer routes in Ticket to Ride. Collecting more small merit awards yields more points at the end of the game—also a little like scoring in Carcassonne. 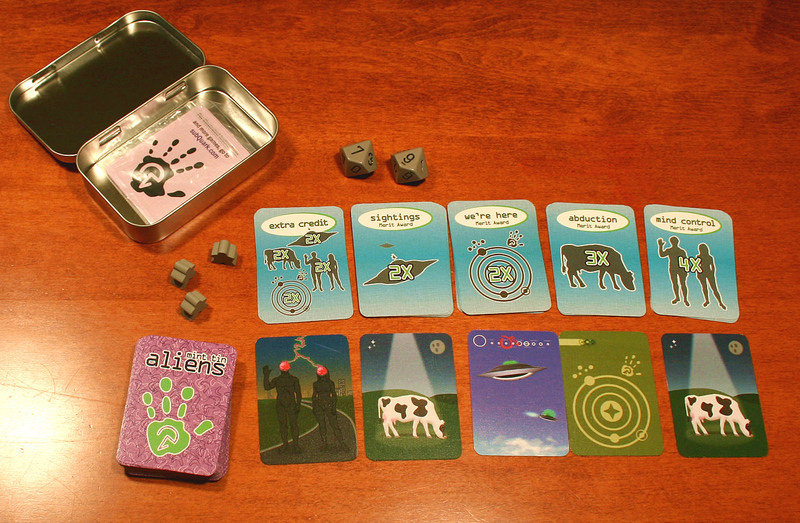 Mint Tin Aliens can be a gateway game to Eurogames by introducing Eurostyle scoring to friends who are new to the fun world of tabletop gaming. Gameplay is quick and tense, as you race against your opponent to be the first to grab the two meeples. I played this with my mom, and we were surprised at the level of player interaction for a set-collection game. 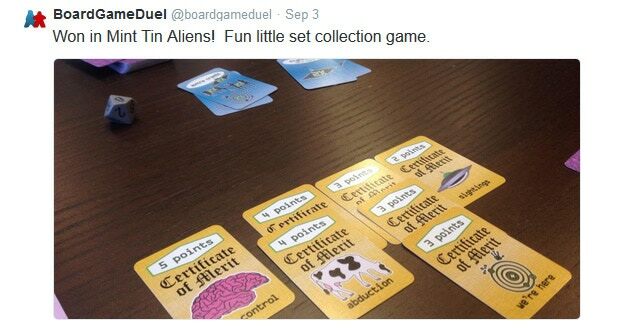 For example, you know the other player really needs that UFO card, but you scoop it up first. Moments like that turn what could be a bland game into a ton of fun! Excellent and entertaining single player version. Awesome PocketMod version by Nate Johnson. PocketMod folding instructions. 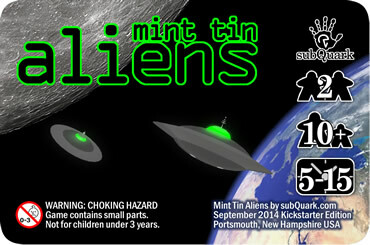 Combines Mint Tin Pirates with Mint Tin Aliens. Excellent French translation of the base rules in a PDF. Outstanding German translation of the base rules in a PDF. Getting ahead in life often means learning new things and taking on new projects, and the Fearless Alien Recruits in Training Program is just what you need. You go head-to-head against another eager recruit and work hard to earn merit awards in what might determine who the next Invasion Leader is. And where does this program take place? Earth, of course! Show your proficiency with map reading to get to Earth, demonstrate your maneuvering skills by creating crop circles, prove your mastery of advanced technology with the Abduct-O-Tron, and show that you can bend humans to your will with remote mind control! Don't miss an assignment or you'll lose points. But you can make up points by doing extra credit. Even get a bonus for completing one of each merit award first! Game setup's quick. Set out all of the merit award cards and shuffle the task cards. Roll your saucer-shaped dice—high roll goes first and each player sets their die with 9 facing up. Place 5 task cards face-up beneath the merit award cards and deal 4 to the first player and 5 to the second. Place the remaining cards face-down. Moolti-pass cards are the exception. If you take a face-up moolti-pass, it counts as both draws. But if it's face-down, it's like any other card and you can draw another. Moolti-pass cards are wild and can be used to complete groups (you could even use several at once, but your alien opponent may not think that's fair). Take and flip over merit awards by playing the number of tasks for each. 4 brains for mind control. Any matching pair can be used for extra credit. You'll likely need to shuffle the discarded cards once to complete a game. When all the merit awards are claimed, it's time to see who's the best. Add up all of your merit award points, and then add the number of cards you have to those points, add the meeples you have (the first player to collect one each of the four awards gets two meeples), and finally add the number on your saucer die.